I don't usually share customer quilts while I am working on them as I feel they should see their quilt first, but I don't think this customer will mind. The quilt will be heading to the National Quilt Championships, so although it is a sample to sell fabric, I'm doing a bit extra on it. Can't have a show quilt going out half dressed can I? Whatever I do will be pretty subtle as the customer has chosen a thread that matches the fabric very closely and the fabrics are quite strongly patterned, but I'm not letting that stop me. I know it will make for a great wholecloth on the back if nothing else. It is however very slow going. 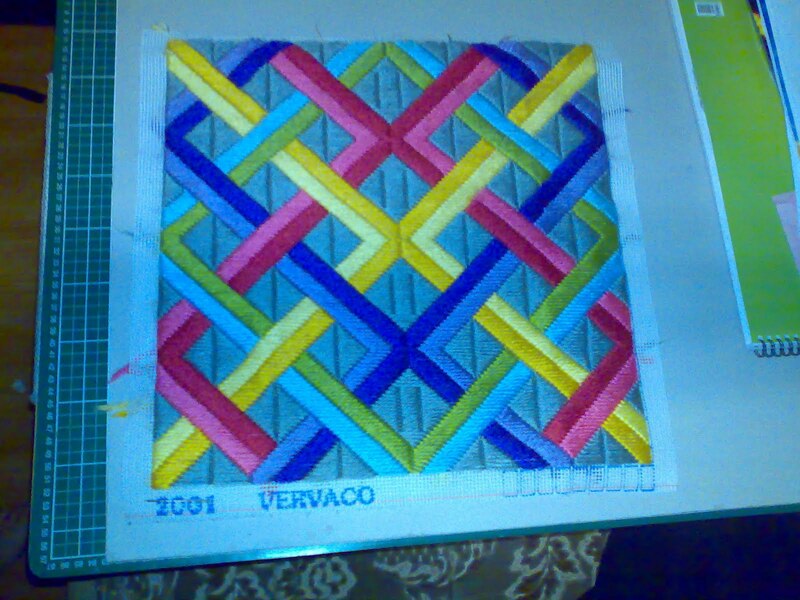 As a normal sample I could quilt this in a day easily. Doing it this way it will be 2 or 3 days. I am really enjoying it and I hope the owner will love it when I've finished. 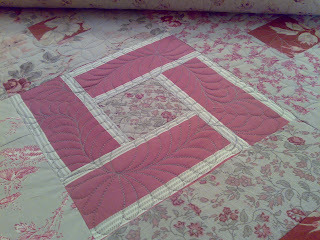 You can tell it's been raining, I've finished my turning twenty 8 quilt top. It's about 120" by 96" and it was made completely in the van. It has taken longer than the other turning twenty patterns I've made but I've really enjoyed it. It is in need ov a very good pressing. Once I started getting bigger pieces I decided the travel iron wasn't up to the job. 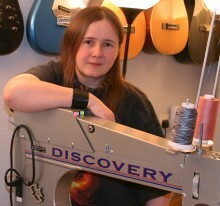 I've been finger pressing the ends of seams as I came to them, but the middle of the seams I left. Dinner seems to be just about hot, so I'll get this off. It's not a huge ribbon, it's not even an average ribbon, it's a little ribbon, but it's mine :) I am soooo thrilled to have collected an honourable mention at the AQS Paducah show. Heck getting in at all was pretty amazing so this is really special. A special thank you to Judy for grabbing the first photos and letting me know. It's a great way to start the day. I'm also pleased that Ricky approves too :) I wish I could have been there for the show, but if the rain holds off the is drag racing to be done. Yeah I know not very likely but that's how it goes. 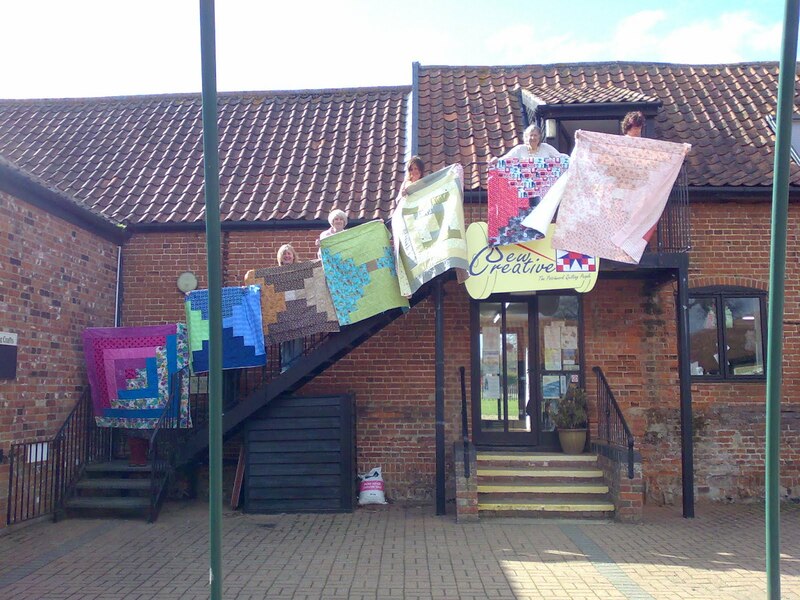 It's next stop will be the National Quilt Championships at Sandown. So if you are in the UK and you want to have a look come and visit it there. Sorry this is a bit late. I got home and got busy. I will also say sorry for any odd expressions in the photo. I am in a sunny queue waiting to collect a package and I can't see them very well. This is the first free time I've had and I hate to waste it. 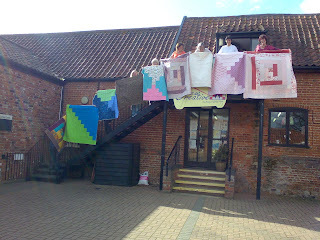 As you can see the venue at Sew Creative is great for taking pictures of speed quilts, even the biggest can be displayed on the stairs. 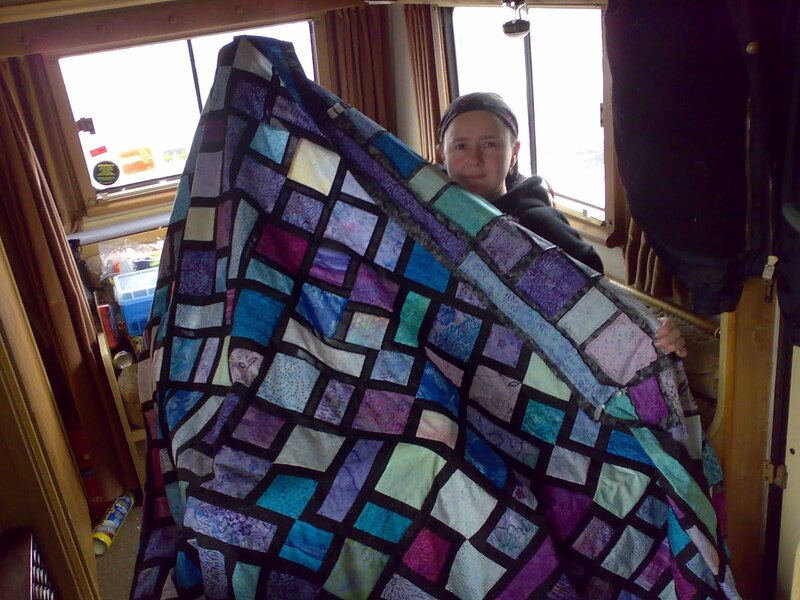 These quilts were all made in a day. Several even did the cutting out during the day. I love speed quilts. They arn't clever and they won't win shows but they make great gifts and will keep you warm. Ah, here is my package, more metallic threads. I will see if we can get the into my online shop over the weekend. 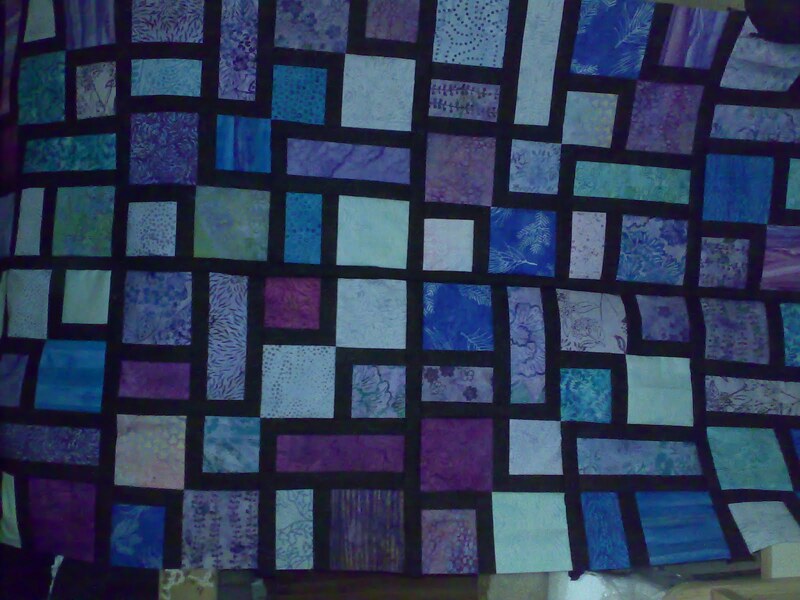 I finally have a chunk of quilt top done. This is less than a third of the top, but it is enough to start getting the idea of how it will look. I've run out of thread now so It seems as good a time as any to start getting everything stowed ready to move the van in the morning. Firstly I need to say sorry to my students and Sew Creative. Several essential items have escaped my requirements list. I am really sorry for the trouble that caused today and for thinking they had gone missing at the shop end of things. Folishly I assumed that as I hadn't edited the list everything would still be on the list, apparently not. I will be fixing it when I get home. 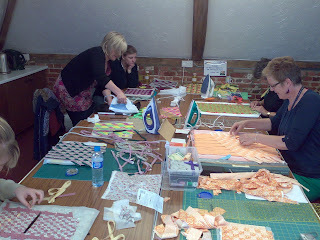 Here are a few pictures of todays class and despite the errors on my list you can see they produced some very good work. In particular there are some really good fabric choices here. I love the purple and grey combination and the shades of brown. Right now I will get back to my sewing but I do have some pictures of yesterdays class to share later. I've got another of my projects finished, the long stitch cushion cover. While I struggle a lot with most hand work long stitch on a large hole canvas works fine, well provided I don't do too much. This has been a year in progress as my travel sewing. I have been looking forward to having it done, I need a cushion when I use my sewezi table in the van. Now I can have one. The turning twenty has progressed again today, I have 3/4 of the sub blocks made. I should get the blocks finished tomorrow and maybe start putting them together. I foolishly forgot to take any pictures of the class today. 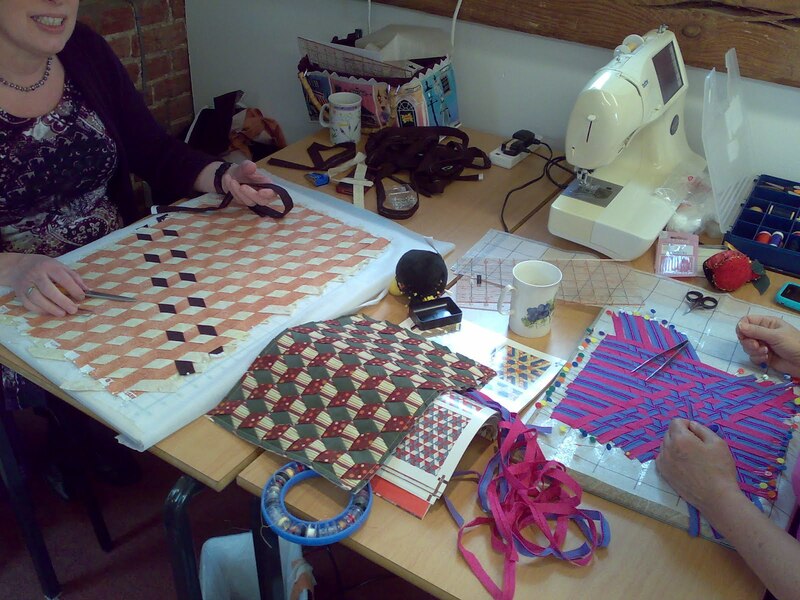 We were working on free motion quilting today and I think it went well. I asked one of todays students to leave her sample to show the class tomorrow and I will try and get a picture of it then. After my early start I am really flagging. It didn't seem too bad getting up early, probably becuase I had gone to bed early and watched a film. Now though I am paying for it. At least I have a later start tomorrow as my camp site is very close to the venue. I didn't manage to finish all ,y projects ;last weekend. I worked out that my jumbo turning twenty has over 1000 pieces so it is taking a bit longer than the others.i was also trying to gwt some racing in but the weather didn't want to play. The cushion cover is very close to done now as that was easy to pick up and put down, so maybe this trip will see it done. i've also brought another project with me incase I run out of things to do, but more on that if I get to it. I am currently near Stanstead. I've got an early but better start to get to Sew Creative to teach tomorrow. I've been looking forward to this trip since last year. I met some great students then and I hope there will be more this time. If you are in the area, Norfolk, there are still a couple of places on some of the classes, call the shop for more details. The other thing about this shop is their location. It's great! The site has a petting farm and several craft shops. There is also a very nice tea room. Even better it is just down the road from a lovely little campsite, so I can park up in comfort and just walk to work each day. Lot's of time to sew too. I should try and get some sleep before the early start. Things are going pretty well. Speed 6 is now finished, bound and everything. It's folded up in the top corner of the picture. I am now working on my second project of the weekend, Turning Twenty book 8. This quilt I started when I was at Quiltfest, on the hand cranked Singer, but I am going to work on it this weekend with the Husqvarna. I do have another van project that will be all[ human powered but this one I just want done. I decided I wanted mine a bit bigger so instead of 20 fat quarters I am using 35 fat quarters. So instead of pressing 40 strips I've just done 70 and cut 210 pieces for the next step. As you can see I can get my cutting board onto the end of my sewezi table, but for pressing I do have to move to the ironing board to the draining board as the iron has a very short lead. Still I think it is a pretty good sewing set up. It may also explain why I don't understand the complaints of lack of space in classes. A 6 foot table looks very spacious to me. I have to admit I suffer terrible table envy when I see other people's studios. 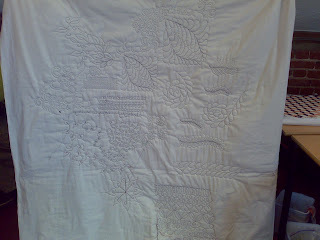 Anyway, I still have a quilt to make, I should get back to it. As you can see I am making good progress with Speed 6. 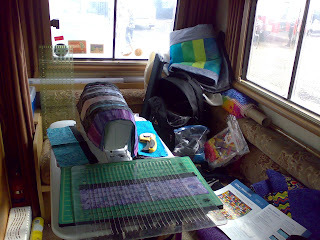 It's great havimng power in the van so I can use my Sapphire and the sewezi table. In fact I have a sewing room, a dinning room and a bedroom in this van all at the same time. Fun fun fun. 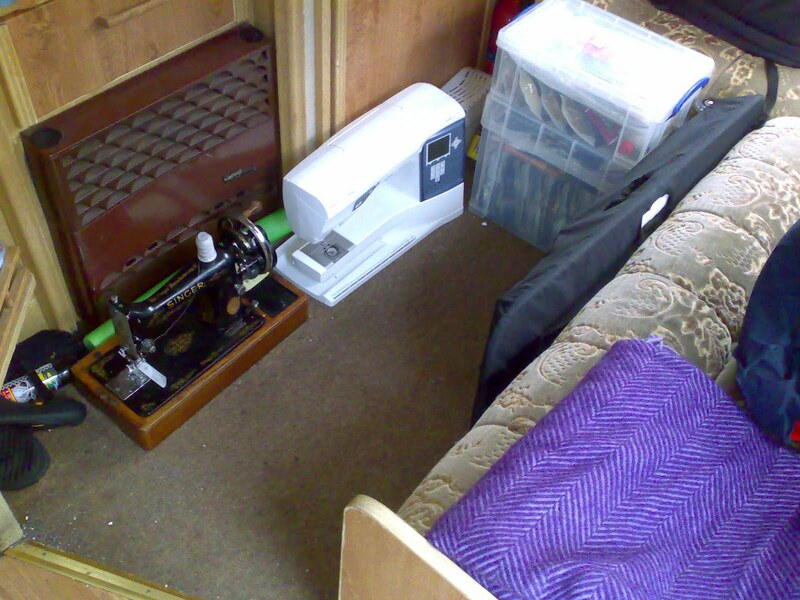 That would be two sewing machines and a Sewezi table. Hopefully Speed 6 and Turning Twenty 8 will get done this weekend, maybe also a rug and a cushion cover, but only if it rains. For me this has been a very very long week. It started badly with one of my cat needing (and wanting) to be put to sleep. I'm glad he agreed, and I am glad he isn't suffering, but he is missed and it wasn't a good start to a week. Now before you read on, I know this will read like and April fool, but sadly it isn't. I can't believe that I am having to put this on, but this whole situation does read like a very bad joke. Rather than then immersing my self in quilting I've mostly been studying law. I'm not a lawyer and I really have no desire to be one but I needed to find out how copyright laws effect quilting. So far the answer is, we don't know and this is a really grey area. 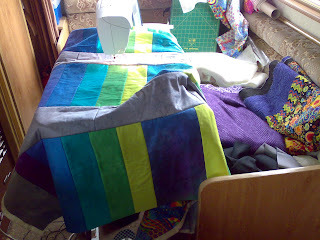 Those of you who buy a pattern and some fabric, make a quilt and sling it on the bed, sofa or friends bed are fine. Carry on the industry loves you and all is well in the world. Once you break out of this into publishing things do seem to get a bit more confused/muddy, and by publishing I do include publishing on the internet. Now a quick side line before I go any further. Things on the internet are not copyright free. I can't tell you how many times in the last week I have seen people saying that anything on the web is in the public domain and free for anyone to use. It isn't. Content on the internet belongs to whoever wrote/drew/created it, and unless they specifically say this item is free for you to use, it isn't. This means I still own the text and images on this blog, (except your comments which are published with your permission) if you wanted to use them for something you need to ask, and for what it's worth you will usually get permission. I've asked many people if I can use their images, mostly for quilts and I've been thrilled by how lovely they have been about it. Usually offering far more than I asked for. Try it you may find yourself a new friend. The flip side of this is that when you post anything on the internet you are claiming you own the copyright and if you don't you are opening yourself up to legal action. 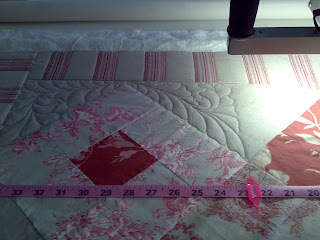 This is where we get to what is giving me the headache, who owns the copyright to the image of my quilts. For a few I can answer that question, I do. Prometheus, Dragon 1 and Greek Fossils are mine. 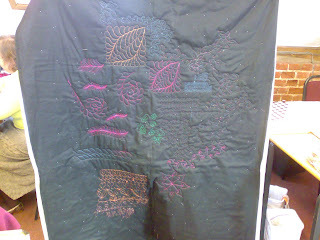 The fabric was produced by Heide Stoll-Weber and she is happy that I own the finished quilts. For the rest of my quilts, who knows. There has been a case where a fabric designer has claimed that she retains rights to the images of a quilt if it contains her fabrics, and she was prepared to take legal action to defend this right. The people she felt were violating her right did cease what they were doing which prevented the case going to court. For me, that's a shame, I need a judge to rule on this to make it clear what everyone's rights are. Unfortunately as it stands this leaves the area grey and people like me making show quilts, writing books and designing patterns in a very difficult position. 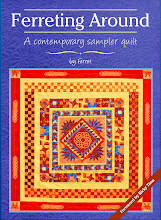 If I don't own the copyright to my quilts I can't use them in books, patterns, web sites. I can't reproduce them on anything, no even my business cards. As a longarm quilter I can't photograph customer quilts and show them on my website to illustrate the work I do. I can't show pictures of my talks or my classes. 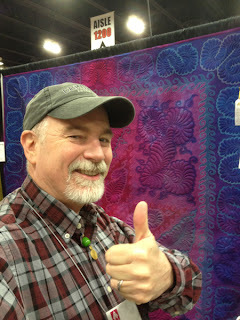 If I don't own the rights to the quilts image I also can't pass those rights on to others, like quilt shows. Crazy, yes. Worrying, very. As I said, for most hobby quilters nothing has changed. 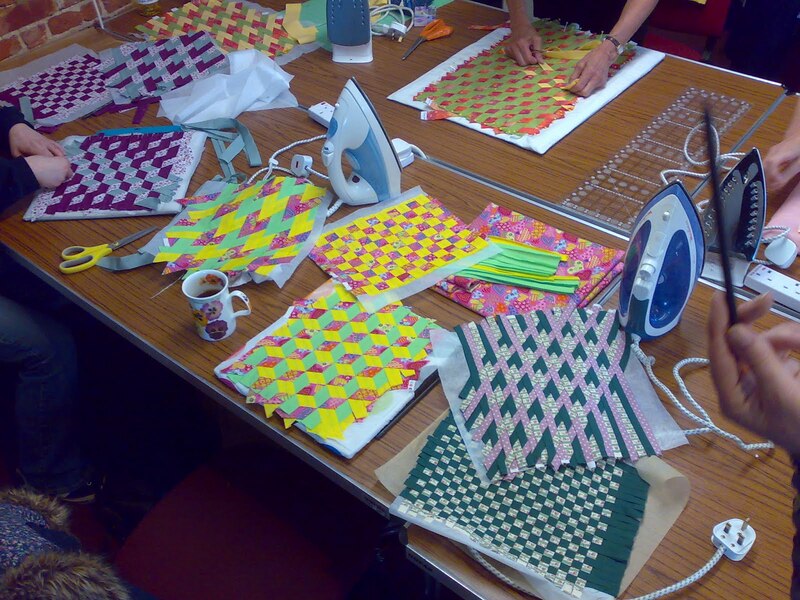 You can buy you fabric, make a quilt and use it. If you are branching outside of that you might want to take a look at the legal situation. I am still waiting on a few more people getting back to me, but I have a nasty feeling the answer will be we don't know. 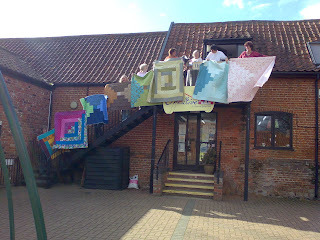 Although even if they come back and say I own the copyrights to my quilts am I in the clear? The problem with the law is it takes money to defend yourself, even if you are completely in the right. If I want to keep using commercial fabrics in my quilts I need to start saving a lot of money to defend any potential law suit, and unfortunately I don't earn that sort of money. 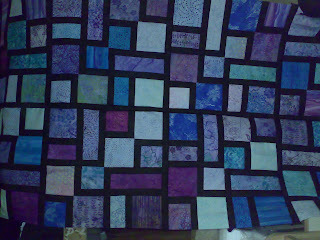 For me just knowing there are fabric designers out there who believe they own the rights to my finished quilt may mean I have to change how I work. No more student quilts in my books (even if the designers would settle for being credited what are the chances of knowing full details on every fabric). Less real fabric images in my patterns and books. More samples made with hand dyed and solid print fabrics. I would love to hear from any lawyer who could offer a solid solution to this problem, but I won't be holding my breath. 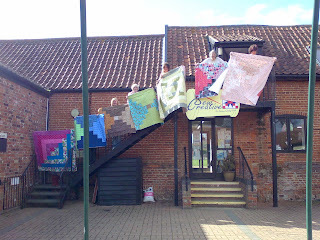 For now my pattern samples are being made with safe fabrics, hand dyed by me and others I know. It lets me sleep at night. 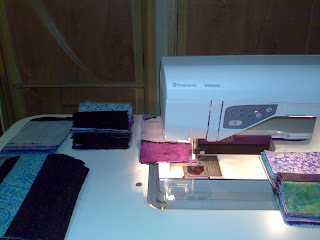 I have designs waiting to be made up that use Moda pre-cuts. It's something that had been requested but students but now I have the fabric and I can't use it. I'm not going to buy more non commercial fabric to make a pattern that will sell the same commercial fabric I now can't use, that would be insane. I have patterns that use large and novelty prints, I am not going to print my own versions of those either, just to sell fabric I still can't use. I really would like to see a solid resolution to this situation. I have a lot of fabric here which seems to now be so much junk. I think the simplest and safest solution would be for fabric manufacturers to publish a statement as to what we can do with their fabrics. With the answer coming back that this is a grey area of law we need someone to make it clear, and I don't think any pattern designer, writer or show organizer has the spare money to take it to court for them, and yes at the end of the day it is at least as much for the fabric manufacturers as anyone else. If the designers and artists can't / won't use the fabric the fabric companies lose the advertising and promotion that brings with it. If quilt shows are forced to ban commercial fabrics to protect themselves the fabric companies lose out more than anyone else. So what we need is for the companies to give us the rights to our finished quilts. The same rights any other artist has to use the image of their completed art work. I think any company who will do this will gain a lot by it as their fabrics will also then be safe to use and right now I am happy to work with fabrics from any company who will do this, I suspect I am not the only one. Anyone want to step up and lead the way?